Posted on September 24, 2011 September 24, 2011 by Debito Arudou Ph.D. Yesterday was an historic day. 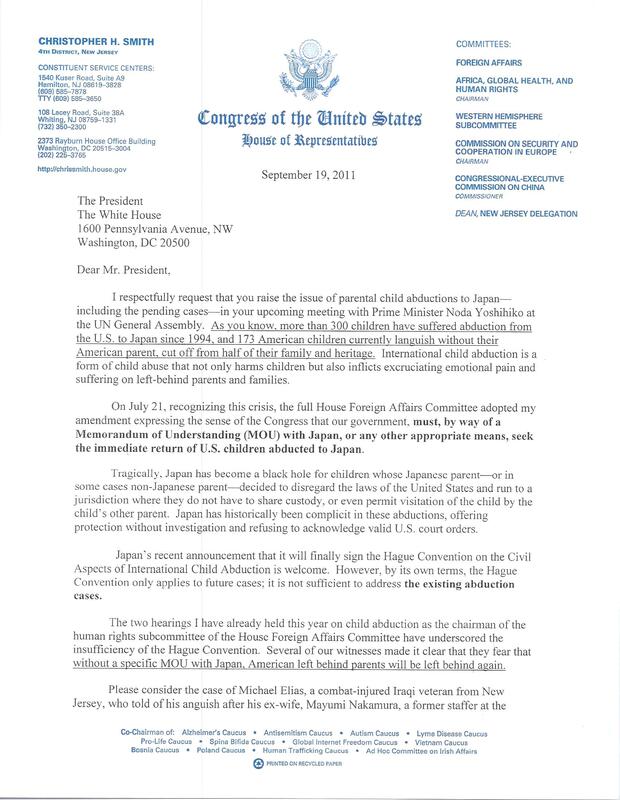 For the first time ever, the Japan Child Abduction issue reached the highest levels of our government. 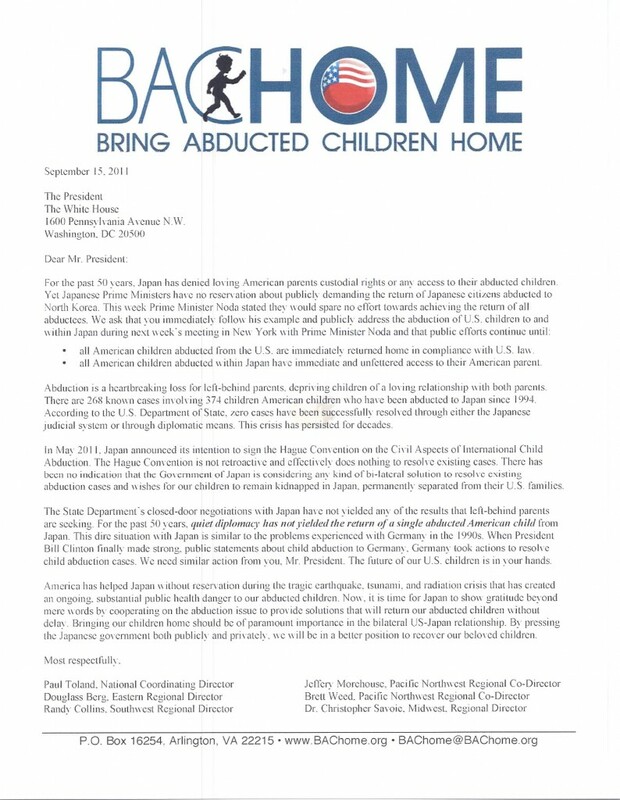 President Obama addressed the issue, to include both the Hague Convention and resolution of existing cases, in his meeting with Prime Minister Noda in New York yesterday. Many thanks to ALL who have worked this issue for the past 15 years to get us to this point. You all contributed in some way. From Walter and Brian, who co-founded CRC 15 years ago, to all who continue that work today. Attached is a letter from BAC Home to the President, delivered last week to the White House on behalf of BAC Home by House Minority Whip Steny Hoyer. Additionally, I have attached a letter sent to the President by Congressman Chris Smith asking that the President address the issue. We all owe a great deal of thanks to Congressman Smith, and the members of BAC Home wish to personally thank him for referring to the BAC Home organization in his letter to the President. It is now our duty and obligation to keep this issue at this high level, and push for further public discussion of this issue by our government officials, until we are reunited with our children. However, if Japan has no effective means currently to assess mental health issues, then such a focus is unlikely to yield much on a short-term basis. A reform of Japan’s mental health care system would be a very large undertaking, after all. — You’re starting to fixate on this one issue. Expand the focus please. I pray Japan will finally do what is right. You gotta understand something this is Obama’s style. In the past in Chicago and now. He tries to address every issue, including this one, just to get the fan base. Actually doing something of substance is another matter entirely. I’d take everything he says with a grain of salt until there’s action. But I’m glad this issue is finally getting some attention. 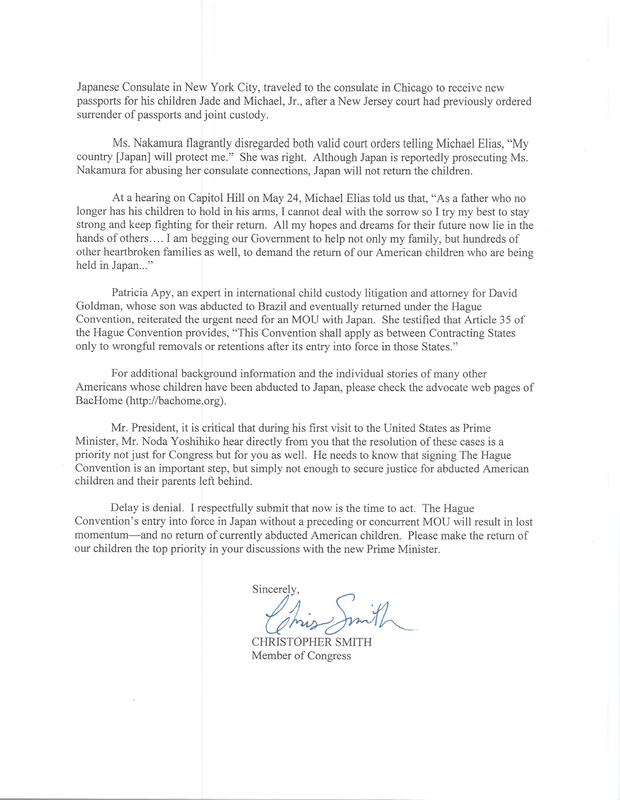 The USA, EU and all other countries who have been demanding that Japan enter into The Hague Convention and return all abducted children immediately, immediately stop any and all overseas aid and money to Japan and impose a minimum 15% tax on all Japanese made goods with a further 5% added per month until this issue is fully resolved and all children returned. I live in Aomori, Japan. I am a divorced American working on the JET program and I have been able to see my son once a month since he was 3 months old. My relationship with my ex-wife started out terrible with threats that I wouldn’t see my son but now it is getting a little better, but I have nightmares and anxiety problems knowing that at any moment my visitations may be suspended if my ex-wife’s attitude changes. I have a question if anyone can help me. I want to register my son as an American citizen but since the divorce, his name has been changed to his mothers last name and I have no legal ties to him in Japan other than being on his birth certificate. Is there anyway to get the US government to recognize that I have a son in Japan and is there any way to make sure that the US recognizes that he is a US citizen? My ex is hesitant to go to the American Embassy. I am his father biologically and in my heart but as far as I know, we are not recognized as a father and son anywhere. ??? Is there anything I can do about this?